The City of San Jose needs more money. Although the “capital of Silicon Valley” has the highest median household income of any major city in the country, years of budget cuts and staffing reductions have left the city in a precarious position, struggling to provide an appropriate level of public services with the resources it has. Compared to peer cities in Santa Clara County and around California, San Jose has less revenue per capita from the two largest sources of local government revenue: sales and property taxes. This public-sector scarcity stands in stark contrast to the region’s wealth and San Jose’s considerable affluence, as measured by high property values and household incomes. It doesn’t have to be this way. 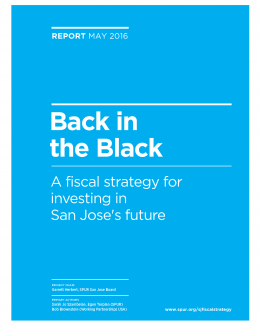 While there are some deeply rooted causes behind the city’s fiscal distress, San Jose has options. This report, a collaboration between SPUR and Working Partnerships USA, provides a road map for San Jose to bolster its resources and deliver high-quality public services.